Volker on Mobile Entertainment: Vodafone Germany envious of T-Mobile's iPhone deal? Vodafone Germany envious of T-Mobile's iPhone deal? German news reports say that Vodafone Germany has sued T-Mobile over its exclusive iPhone arrangement with Apple. Vodafone challenges the "combo" of iPhone and a 2-year-contract and asserts that this might be contrary to fair competition laws. Vodafone Germany's chief describes the iPhone as the "fall of man", which is pretty funny, come to think of it. The manager says they would fear that the likes of Nokia and Motorola would follow the example and do the same, which would heavily distort the market. Hmm. Who had this thing with its logos on handsets again? 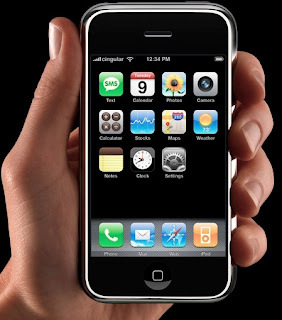 Who was the only carrier distributing Sharp handsets? Ah... Given Vodafone's approach with the rather successful Sharp GX series, which was exclusively (sic!) available to, yes, Vodafone customers, the suit does not feel entirely sincere. One might plead that Vodafone fails on the "clean-hands" doctrine (which, alas, is unknown to German law). This is of course also noteworthy as Vodafone Global CEO Arun Sarin went on record saying that the iPhone makes for a "pretty poor experience" (unless you are in a WiFi area) and all. Why then do they insist this is such a bad thing? Do we take it as a sign that the lost iPhone deal might after all have a certain sting to the mighty carrier? This is in spite of it still possibly proving to have been the right decision, with Apple's share in user fees and all. It may well all come down to branding: Vodafone is thought to have spent hundreds of millions on trying to build its Vodafone Live! brand, which it all but abandoned recently. It was the first big carrier to partner with Nokia on the latter's Ovi initiative (see here), which in itself may be seen as an admission of failure of its own service. Whilst I understand Vodafone's move from the view of the German lawyer I (also) am, the overall approach has something of a child envious of another one's toy. UPDATE: Further reports shed more light onto this. T-Mobile may be forced to sell unlocked phones and also give up the 2-year tie-in, i.e. offer consumers to buy the iPhone without a contract. This would be a major blow to the Apple business model and one that might force others to open up, too: MoCoNews reports that French laws have similar provisions. Most importantly perhaps, European laws on the freedom of goods and services would prevent anyone stopping grey imports into other EU member states where Apple struck other exclusivity deals (e.g. with O2 in the UK), which might become a real threat to Apple's business model altogether.